If week five seemed strange and filled with upsets, week six could possibly go down as the most upset-heavy week of the entire regular season. Essentially, everything and nothing went according to plan. From a betting perspective, it is perhaps a big frightening to bet when things are so volatile – mid tier teams are on an uprising, whereas the very top remains somewhat inconsistent, still strong but incredibly vulnerable at the same time. For today, we have a fairly mild set of affairs. The only match where you would think twice before predicting the winner would be the Schalke vs. ROCCAT one. Every other match is pretty much a clash between a top five team, and a bottom five team. Because of this, betting should be extremely straightforward. Unicorns of Love vs. Splyce – For our first match of the day we have a fairly uninteresting clash between Splyce and UOL. Now, both these teams are at different paths right now. 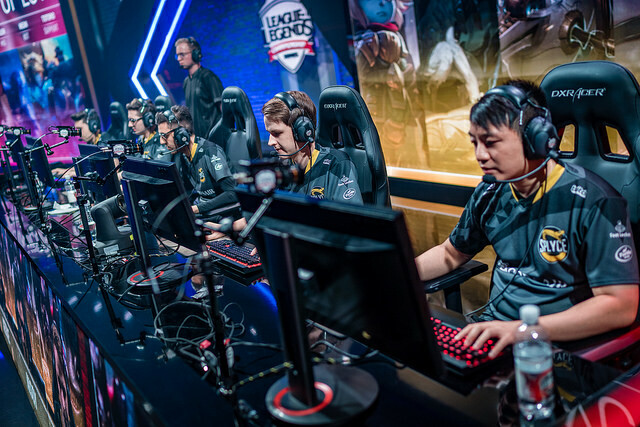 The Unicorns just want to save face and accumulate as many wins as possible – their Summer Split run was far from engaging and praise-worthy. There were a couple of games when they were able to play to their full potential, but those were few and far between. They’re just not that strong in the current meta, and even if a meta shift did occur, they would still occupy the bottom of the standings. Right now, the gap between their strength and middle-of-the-pack teams like ROCCAT or Team Vitality is far too big. Splyce, on the other hand, are coming off of their biggest win this Split. The fact that they were able to take down Misfits last Saturday is a small miracle for anyone sporting a Splyce jersey. It wasn’t pretty, in fact, it was a pretty appalling game, perhaps the worst one of the split. With just four kills in almost forty minutes, there was very little action, proactivity or willingness to engage. It was the cliche Splyce strategy from Spring – prolong the game until the ultra late game (and forty minutes in the current meta definitely falls under that category) and hope for the best. This time around it worked, and the fact that they were able to upset Misfits might be the main reason in their path to securing a playoff spot. They know that this is a very winnable match, so they probably won’t be taking any risks. They need to win both of their wins this week in order to leapfrog ROCCAT in the standings and come one step closer to reaching the Top 6. FC Schalke 04 vs. ROCCAT – This is where things get very interesting, very quickly. It’s impossible to predict the outcome of this match with confidence, and that’s a problem. Let’s tackle Schalke first. Last week was the perfect display of what they’re capable of. Their game on Friday against Fnatic was absolutely painful to watch – they were outclassed from minute one. It was a complete shellacking, and after Caps and Broxah pulled off an insane tower dive even before the five minute mark the game was essentially over. It was the Schalke of old. Lost, passive, afraid to engage. Five great players overall, but no one really willing to step up and carry. They don’t have a Caps, a Rekkles or a Perkz – and they need one badly. They were destroyed on all fronts by Fnatic, and it was a strong reminder in just how big the gap between the current kings of Europe and the rest of the region really is. But then came Saturday. Schalke – for the first time in what feels like an eternity – decided to draft aggressive, “in your face” picks. They didn’t put Vizicsacsi on a tank – something that also took everyone by surprise. The 2017 Spring Split MVP was finally getting a chance to play League of Legends – and he didn’t disappoint. Even more surprising was the fact that Nukeduck went for Zed – that’s a bold move, especially considering the fact that he was up against Perkz – one of the most lauded and respected mid laners in the world. They decided to go for something unique, something different, a team comp that suited their strengths and virtues rather than a blatant carbon-copy of what’s meta. But even in their sensational upset over G2, there were asterisks. Jankos had one of the worst performances of the split – he was basically inting in front of thousands of spectators. His Gragas play was downright abysmal and it cost his team the game. Schalke did really well, but how much of that came from G2’s horrendous misplays? One thing is for sure, and that’s the fact that Schalke’s potential is undeniable. They’re not a top tier team, they’re not Worlds material, but they’re solid, and it’s been quite a long time since you could actually say that and not burst into laughter. Even though ROCCAT also had a 1W-1L week, they lost quite a lot of stock overall. They had all the momentum heading into their clash with Vitality, but they failed to capitalize. The biggest problem isn’t that they lost to Vitality, but rather the fact that they lost to one of the teams that they’re fighting against to reach the playoffs. Right now, it seems won’t be able to achieve anything more than they did in Spring. The only question now remains is – will they reach the playoffs or remain on the sidelines? Perhaps it would be best if you’d just skip betting on this match altogether. Both teams have very high highs, but abysmal lows as well. ROCCAT was a lot more consistent throughout the last six weeks of competitive play, but right now that means very little. There are just far too many question marks regarding this match-up, so it’s best just not to risk it. G2 eSports vs. H2K – After a very tight clash, we get… this. A fight between the third best team in the region, and a team that has yet to get even a single win. It’s not exactly screaming “high-octane League of Legends”, but it could be a somewhat engaging scrap, especially if H2K come out the gates swinging. H2K did show something new last week. A double smite combo wasn’t enough to take Fnatic down, but they did catch them off guard. They’re finally starting to play like they have nothing to lose and that’s when things get very interesting. If they play without fear, they could upset – and if G2 aren’t prepared for some insane doses of cheese and off the wall strategies they could be on the receiving end of things. They also reintroduced Caedrel to their starting roster, this time as a jungler. While they didn’t achieve success, the guy was able to reach Rank 1 on EU West in four months time with a fantastic win ratio, so he could be potentially pretty dangerous further down the road. G2 really need this win. And not just that, they need to demolish H2K in order to regain at least something resembling momentum. They’ve not only looked vulnerable over the last couple of weeks, but at times even bad. Sure, they demolished Splyce last Friday without breaking a sweat, but their performance against Schalke was absolutely abysmal, and it’s not like Schalke is the epitome of aggressive, proactive play. Perhaps the biggest problem was just how badly Jankos played. It doesn’t matter if you’re a great team if you have a jungler that’s underleveled and who keeps getting caught at the worst possible time. They simply had too big of a deficit when the mid game came around, and the fact that they were essentially playing 4 vs. 5 didn’t help. At all. We’re going with G2 on this one. Even though they haven’t been playing that well recently, they have an incredibly solid foundation, and they have the basics down to a tee. That alone should be more than enough to take H2K down without much trouble. If they restrain Jankos from feeding, and play a slower, more calculated game they should have this game in the bag. Misfits vs. Giants – Continuing on the “uninspiring match-up” trend from last game, we have a fight between Misfits and a struggling Giants squad. Misfits didn’t really have a solid showing last week. Sure, they demolished the Unicorns of Love but that was completely expected. When their game against Splyce came around though, the aggressive, proactive Summer Split Misfits were nowhere to be found. They were hesitant, afraid and lost. They couldn’t set up and take down an objective if their lives depended on it, and it was a crushing sight especially after watching them dominate and develop over the entirety of the Summer Split. They just didn’t play well – neither as a team nor individually, and it’s not just that one game. They looked far more vulnerable over the last two/three weeks than anyone would have expected. Fortunately, they have some of the best players in the region as well as a stellar coaching staff, so they should be able to bounce back fairly quickly. As for Giants, they failed to build on their recent momentum as they ended last week with two losses. They’re now no longer tied with the Unicorns, and they have sole possession of ninth place which is pretty disappointing. They had a small resurgence a couple of weeks ago, however with only three weeks of competitive play left, their regular season is essentially over. They could still upset here or there, but other than that they don’t have a reason to tryhard. Even though Misfits didn’t play that well over the last two weeks, they’re still head and shoulders above Giants in every facet of play. They also need this win to bounce back from last week’s abysmal showing against Splyce. Fnatic is hot on their tail, so Misfits can’t afford to drop another game, especially not to a lower ranked team such as Giants. Misfits need this win, and they need to rebuild their confidence coming into the playoffs. There entering this week with a chip on their shoulder, and an aggressive Misfits squad with something to prove is a very frightening concept. Team Vitality vs. Fnatic – A very entertaining scrap to close out the day. 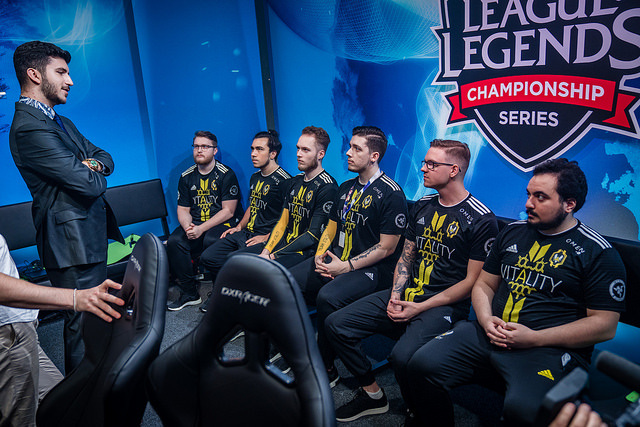 Vitality were finally able to get back on track and actually secure both wins last week – and with an all new jungler to boot. Kikis made the best of the opportunity Vitality gave him. Not only did he play well, but he affected Vitality’s play almost immediately – they were more subdued, they took breaks and focused more on macro rather than brute force. It was a refreshing sight, as this was a completely different from what we’re used to. It’s hard to really predict how high they’ll go, but their playoff spot is almost a sure thing. They can afford to lose to Fnatic and still not lose any stock. If this is the dawn of a new, more mature Vitality, then they could very well be a real threat in the playoffs. They always had the mechanical skill, they were only lacking in the strategic department. As for Fnatic, it seems like they can’t do any wrong right now. Whatever strategy or team comp they come up with, they’re making it work, they’re executing some insanely complex strategies and ideas to perfection, and watching their games this split has been an absolute must, regardless if you’re a fan or not. It doesn’t matter which Vitality comes to play, whether it’s Gilius, or Kikis, or someone else entirely. The level of play that Fnatic displayed last week was absolutely astonishing. They have an incredible grasp of the meta, they have the absolute best players in each and every single role, and they’re always experimenting and making things work, even when the odds are stacked against them. Because of this, betting against Fnatic is simply impossible. Vitality could make this into a somewhat close game, but Fnatic should emerge victorious regardless. Well, yesterday didn’t really go according to plan. If there is one thing that’s evident right now, it is the fact that the middle-of-the-pack teams are almost all on an uprising. That might not change the final outcome for the playoffs, but right now it’s causing absolute chaos. It’s exciting and exhilarating, not knowing how a game will turn out, but at the same time this is a very unthankful time to be betting on the EU LCS, as anything can happen on any given day. Yesterday the two of the best teams in the region both lost – we had the number one team lost to the ninth ranked team, whereas Fnatic lost to Vitality, not such a big upset but still a surprising outcome nonetheless. Giants vs. ROCCAT – To start things off, we have a fairly interesting clash between two teams that are fighting to reach the playoffs. Right now though, ROCCAT is far closer to that goal, but that doesn’t mean Giants won’t come out the gates swinging. In fact, after seeing Giants dismantle Misfits from the very get-go, it’s kinda hard to bet against them. The thing is, they didn’t win through a cheese strategy, or by pure luck. They were better than Misfits in every stage of the game, and it showed. Djoko completely outclassed Maxlore, and it was yet another reminder of just how inconsistent Misfits are right now. Not to mention their individual volatility. ROCCAT, on the other hand, went blow-for-blow with Schalke, but their abysmal drafting and highly questionable in-game decision making showed up once again. They’re currently in a very tough position. If they lose against Giants they’re almost surely out of the Top 6, and even if they win they will still be ranked seventh. This is an incredibly hard match to predict right now, but we’re going with Giants, albeit not with full confidence. They displayed some serious confidence and team cohesion yesterday, and they’re all pumped to make a run for the playoffs. Even though they probably won’t make it in the end, they will surely cause a lot of damage to other teams in the process. Splyce vs. H2K – Quite possibly the least engaging match of the day. However, for Splyce this is an absolute must-win. They’re coming off of their strong showing against the Unicorns of Love, and they absolutely have the tools to take H2K down as well, in relatively quick and clean fashion. They need every single win that they can get in order to secure a playoff spot and they know it. That said, H2K are playing better over the last two weeks. They’re playing like they don’t have anything to lose, and they at least did something right against G2. While it wasn’t enough to make it into a competitive game, they at least gave it their all. Betting on Splyce would be the more logical choice. Team Vitality vs. Unicorns of Love – Another pretty straightforward match-up. The fact that Vitality has been able to win three out of three games with Kikis in the line-up is a pretty big deal, and it goes to show how just a single change in the roster can make all the difference. He has a completely different playstyle than Gilius – he’s more “selfish”, focuses more on creating his own leads and counter-jungling rather than pressuring lanes and ganking. So far, with three “Player of the Game” accolades, he’s been doing a ton of work for Vitality, and they’re almost surely locked into the playoffs. The Unicorns might be able to make this somewhat close, but they shouldn’t be able to compete with the team that took down Fnatic yesterday in such clean and dominant fashion. G2 eSports vs. Fnatic – To many, this is the match of the week, and to make matters even more interesting both teams are currently tied in the standings. G2 are coming off a win – however it was a win over H2K, hardly anything worth mentioning. And even in their win against the only winless team in the region they didn’t really look that incredible – other than Perkz who absolutely demolished on LeBlanc. Fnatic are coming off a surprising loss to Team Vitality. Nothing went in their favor, and to make matters even more complicated, they drafted a pretty illogical draft, so they were fighting a losing battle from the very beginning. All of their lanes were losing – sOAZ, Caps as well as Bwipo and Hylissang, which meant Kikis had free reign in the jungle match-up. He was able to heavily punish Broxah and create a lead that eventually became insurmountable. This was vintage Vitality from Spring. Aggressive, making plays all around the map, brimming with confidence. Fnatic on the other hand looked tame, and in general when they’re behind in gold they don’t really fight intelligently – they try to brute force things and hope for the best. This is a very hard match to predict, as we really don’t know which G2 will show up. Will we see the dominant G2 from the beginning of the Summer Split, or the inconsistent, out-of-sync G2 that’s been more visible over the last three weeks? Regardless, Fnatic – barring any abysmal drafts – should have this one in the bag. It might not be pretty, but they know that this is a must win if they want to secure a playoff bye. Misfits vs. FC Schalke 04 – To close out the week, we have yet another incredibly interesting match-up. This time around, it’s a clash between the – statistically – best team in the region, and a serious contender that’s been on an upswing over the last couple of weeks. It’s still somewhat strange when you realize that Schalke have been winning like crazy – in fact, they won six of their last seven games. While the level of their opposition wasn’t always that high, winning at such a consistent basis is fairly impressive, especially for a team that used to struggle so much. This will either be a complete snooze fest, or a brutal war. Misfits haven’t been performing well at all over the last couple of weeks, whereas Schalke is currently on an upswing. The biggest problem that Misfits have right now is their indecisiveness, and that is exactly the area where Schalke is excelling right now especially with Amazing at the helm. We’re siding with Schalke on this one, but not with full confidence. However, after seeing them play this consistently it’s hard to bet against them.